With the advent of the Web along with the unprecedented amount of information available in electronic format, conceptual data analysis is more useful and practical than ever, because this technology addresses important limitations of the systems that currently support users in their quest for information. 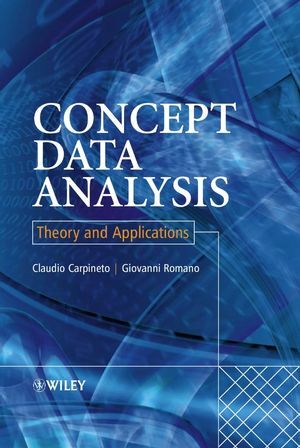 Concept Data Analysis: Theory & Applications is the first book that provides a comprehensive treatment of the full range of algorithms available for conceptual data analysis, spanning creation, maintenance, display and manipulation of concept lattices. The accompanying website allows you to gain a greater understanding of the principles covered in the book through actively working on the topics discussed. The three main areas explored are interactive mining of documents or collections of documents (including Web documents), automatic text ranking, and rule mining from structured data. The potentials of conceptual data analysis in the application areas being considered are further illustrated by two detailed case studies. Concept Data Analysis: Theory & Applications is essential for researchers active in information processing and management and industry practitioners who are interested in creating a commercial product for conceptual data analysis or developing content management applications. Claudio Carpineto is the head of the Information mining group at Fondazione Ugo Bordoni, in Rome. He has published numerous articles on artificial intelligence. Giovanni Romano is the author of Concept Data Analysis: Theory and Applications, published by Wiley. 1.1 Basic Notions of Orders and Lattices. 1.2 Context, Concept, and Concept Lattice. 2.4 Adding Knowledge to Concept Lattices. 4.1 Mining the Content of the ACM Digital Library. 4.2 MiningWeb Retrieval Results with CREDO.